You are here: Home / Business Analysis / Business Analyst and Enterprise Architect – Cats and dogs ? 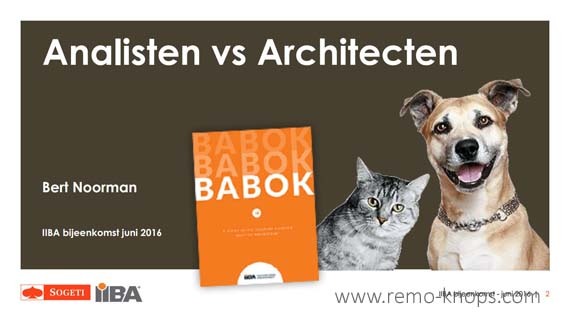 The Dutch Chapter of IIBA organized a knowledge session titled: “Business Analyst and Enterprise Architects – Cats and Dogs?” on 21st of June 2016. During this session Marlies van Steenbergen, principal consultant enterprise architecture at Sogeti and one of the founders of DYA, presented the Enterprise Architect perspective. Bert Noorman is an experienced Management Consultant and Enterprise Engineer, specialized in Process Management and Business Analysis, presented the Business Analyst perspective. Do you think Business Analyst and Enterprise Architects have an overlap in their domains and expertise or are they cats and dogs that fight each other? BABoK 3.0 = Business Analyst 3.0 ? Marlies van Steenbergen would like to answer the question should an enterprise architect in an agile world simply continue in a monotonous way or should the Enterprise Architect change multi-dynamically ? An Enterprise Architect aims to provide relevant in context advice (on enterprise architecture) on the moment of decision making. New methodologies like scrum, agile and dev ops for example result in shorter iteration cycles. The impact of social innovations and the speed of technological innovations put the field under pressure. Just enough, just in time. Just enough, just in time Enterprise Architecture is centralized around three themes according to Marlies van Steenbergen. First an Enterprise Architect must be able to quickly understand the impact and value of a proposed change in the enterprise model. ArchiMate, an enterprise architecture modelling language, and proper tooling can help in this regard. Playing with conceptual frameworks helps understanding “the problem”. In summary the Enterprise Architecture field is changing from a more static, waterfall driven profession to a more dynamic profession based on principles and patterns, with a interactive design approach based on a change management team that shares responsibility. Marlies van Steenbergen summarized the changing field in a simple table. 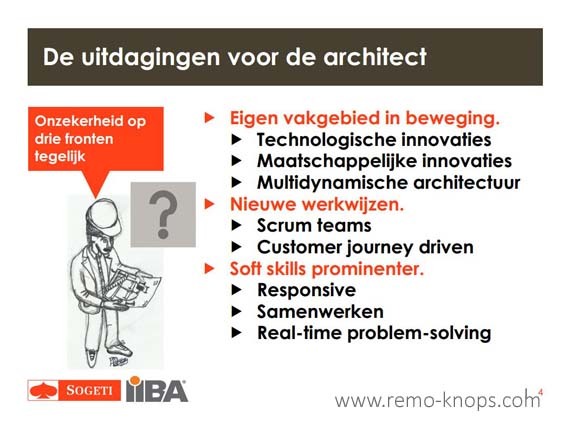 Please download the slides (in Dutch) from the IIBA Dutch Chapter website. A business analyst starts with analyzing the current state, and looking at the future state. From there the transition state is defined. In summary the approach is inside-out. 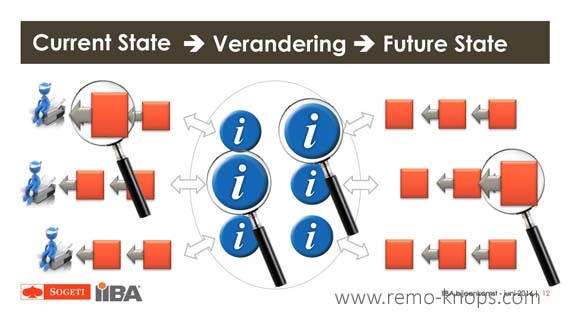 When modelling those states, a Business Analyst typically draws the process or information flow. This enterprise model looks like some sort architecture, right? 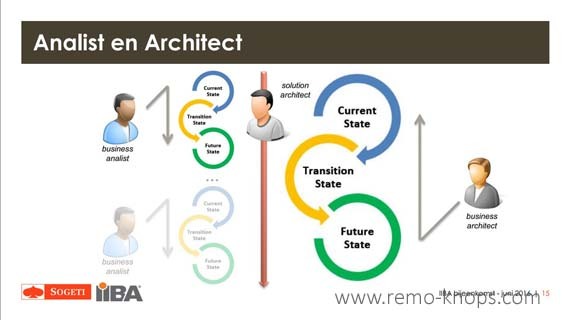 The enterprise architect starts outside in, looking at how the future state would look like and starts thinking how those future implications would impact the current state and current architecture. 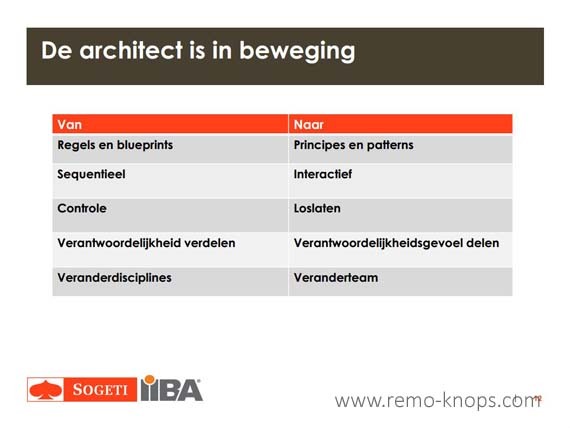 Bert Noorman looks at the BABoK definitions of the Business Architecture Perspective and the Agile Perspective. 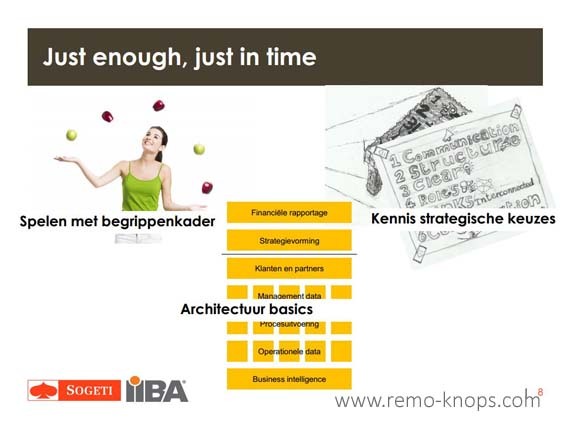 Marlies van Steenbergen and Bert Noorman covered the perspective of Business Analyst and Enterprise Architect. The potential overlap between these two professions, was also (visually) illustrated by Bert Noorman. During a break-out session various statements about the enterprise architect and business analyst roles were discussed. Group members could vote for the statements to be discussed. Because both roles were available the result was a lively and open discussion. A great part of the event is connecting with new people in the same role or area of expertise. A great many thanks for the Dutch IIBA team for the excellent organization of the event and thanks to Sogeti Netherlands for hosting the event.